Αn insurance company analyst, Master Naturalist, Department of Transportation employee, and conservation biologist walk into a bar. What do they have in common? Now that I have your attention, it was not a bar, but, rather, the meeting room of a public library — and, on July 17, I found myself in that very room.The four were gathered as part of the Virginia Safe Wildlife Corridors Collaborative (VSWCC) — a nascent group formed to reduce animal-vehicle collisions on roads and provide safe passages for wildlife. Bringing together groups like the Virginia Department of Transportation (VDOT), the Virginia Department of Conservation and Recreation, the Highway Loss Data Institute, and conservation groups like the Wildlands Network and Wild Virginia, VSWCC takes a multi-stakeholder approach to a complex, multi-disciplinary issue in road ecology. The Collaborative includes an analyst from Highway Loss Data Institute, who provides insurance companies with crash data; a conservation biologist from William & Mary, who does GIS mapping of animal habitat near interstates; a veterinarian from the Wildlife Center, which cleans up the carnage from crashes; an employee of VDOT — who researches animal passageways and measures to mitigate wildlife crashes; and Wild Virginia Director Misty Boos. Also involved are members of the Virginia Department of Game and Inland Fisheries, which releases statewide Wildlife Action Plans to determine the species of greatest conservation need in Virginia; the coordinator of the Virginia Master Naturalists Program, which provides training in ecology, animal and plant identification, and the scientific method; and a member of the Wildlands Network, which works to promote habitat connectivity, the Collaborative’s bigger-picture goal. A map of core habitats (green) and corridors between them (yellow) in Virginia, from the Wildlands Network. In the modern age, animal core habitats have become increasingly fragmented. Due to human construction, land mammals move two to three times less than they used to, which means a limited ability to mate, feed, and migrate. Coupled with the fact that fragmentation reduces species richness and nutrient cycling, and climate change forces relocation, the threat of species extinction looms more ominously. A widely-accepted connectivity strategy that supports species migrations is building wildlife corridors. Corridors can vary in shape, scope, and the species on which they focus, but they all seek to connect protected areas of habitat. Currently, only half of protected habitats around the world are connected. The Wildlands Network spearheaded the Eastern Wildway Initiative, which seeks to create a continuous unobstructed stretch of wildlife habitat along the East Coast, from Quebec to the Gulf of Mexico. 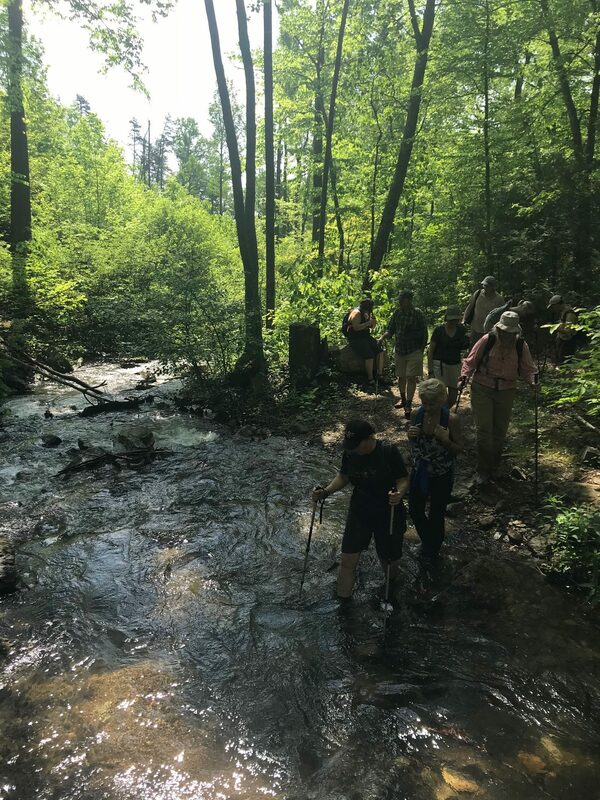 This wildway would contain some of the country’s most beloved wild places, from the Adirondacks to the Shenandoah Valley to the Great Smoky Mountains and Everglades National Park. The region harbors a wide range of climates, eco-regions and enormous biodiversity–in fact, the southeastern U.S. is one of the world’s biodiversity hotspots. Wild Virginia is working to contribute to the Eastern Wildway as they work to improve habitat connectivity in Virginia. 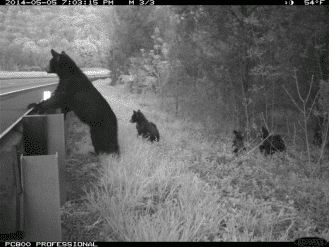 A mother bear and her cubs look over I-64. Photo credit: Bridget Donaldson of VDOT. The group’s primary concern is human safety, which is threatened by vehicle crashes with large animals like deer and bear. VDOT tracks bear and deer carcass data, and VDOT’s Bridget Donaldson has used this data to pinpoint hotspots for deer and bear crossings. According to Donaldson, deer make up 1 in 6 animal-vehicle collisions in Virginia, which puts the state in the top ten for deer-vehicle collisions nationally. VDOT has begun building fencing to funnel animals into existing underpasses beneath large highways. On Interstate 64, 8 foot-high fencing now guides animals to a box culvert beneath the roadway and a bridge spanning a river. Cameras installed at the site show animals coming up to the fence, and turning around to find another way around, rather than crossing the interstate. It’s estimated that this is reducing crashes at a cost savings of $300,000 per stretch of fencing. The fencing includes jump outs: sections of fencing angled at the top to allow deer to pass one way — out of the road — but not the other. Recently, VSWCC has installed cameras in Buffalo Creek and Cedar Creek, which will be continuously monitored during November, deer breeding season. 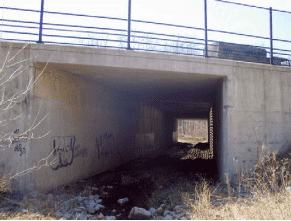 A box culvert under I-64. Photo credit: Bridget Donaldson of VDOT. At this point, you might be asking: why did the bear cross the road? But, in all seriousness, what is the biological impetus for large animals moving around so much? When mating, large-scale movement is crucial for genetic exchange and enhancing genetic diversity. Otherwise, inbreeding within the same area can hurt a species, reducing the biological fitness of a population. Animals are naturally accustomed to moving around not only when mating, but when searching for food. Bear, whose food is scarce during winter months, must eat large amounts of food during the summer to survive, so they move constantly move to find it. In the effort to reduce large-animal collisions, the Collaborative hopes Virginia will follow in the footsteps of other admirable states. In Montana, a 56-mile stretch of highway boasts 41 overpasses and underpasses for animals like deer, bear, coyotes, and bobcats. In Wyoming, underpasses for moose and elk and overpass bridges for pronghorn have reduced collisions tremendously. In Southern California, biologists have erected underpasses for the threatened desert tortoise, which long-tailed weasels and foxes have also benefited from. In Washington, squirrels cross over a major road on a narrow rope bridge between trees. Outside of the U.S., the Netherlands has over 66 overpasses and ecoducts (wildlife bridges) to protect species like the endangered European badger, wild boar, and various species of deer. The Netherlands also boasts the longest wildlife overpass in the world, a half-mile long natural bridge which spans a railway line, park, roadway, and sports complex. In Australia, a bridge on Christmas Island helps 50 million red crabs migrate over a busy road. 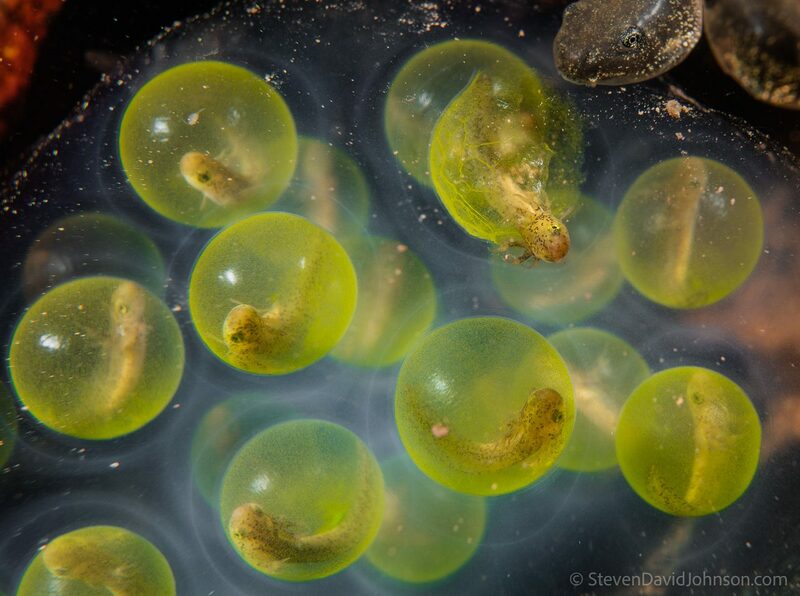 Spotted salamander embryo emerging from egg in George Washington National Forest in Virginia. Photo credit: Steven David Johnson. VSWCC also has a Small Mammals and Herps Working Group. One animal the Collaborative focuses on is salamanders, whose core habitat is the vernal pool, a type of wetland generally devoid of fish. When breeding, salamanders must migrate back to their vernal pools, which often means crossing roads. To curtail salamander-vehicle collisions, the Collaborative is looking to use drift fencing to guide salamanders through plastic tubes under interstates. Other states — like Massachusetts and Vermont — have had success with similar projects. A mass migration of salamanders in Charlottesville has led volunteers to block off roads to aid their crossing, during which the majority of salamanders normally die. Because of volunteer efforts in February, the development company owning the road (Polo Grounds Road) agreed to construct a salamander tunnel underneath it later this year. Fortunately, researchers in Vermont have mapped vernal pools across the entire North East (and included Virginia), which has aided in this mission. The Small Mammals Work Group is also considering possible efforts toward the eastern spotted skunk (which is very slow) and the northern flying squirrel (whose habitats are often fragmented). It is also looking at ways to improve habitat connectivity diamondback terrapins at sites near the Virginia coast. Moving forward, the group looks to influence public policy by making animal-vehicle collisions a priority for state lawmakers. According to VSWCC, policy must protect both core habitats for animals and the “corridors” that enable safe passage between them. In 2016, a Virginia congressman introduced the Wildlife Corridors Conservation Act to the House of Representatives, which helped bring attention to the issue at the federal level. The Collaborative hopes to introduce a similar bill to the Virginia General Assembly in 2019. VSWCC also hopes to follow other states’ lead in increasing opportunities for citizen science, creating systems for reporting animal crashes by taking photos, obtaining GPS coordinates, and collecting user data about animal carcasses on roads. The Collaborative’s next meeting is October 15. Hopefully, the Collaborative will soon have opportunities for volunteer involvement. In the meantime, keep your eye out for roadside critters on your daily commute! Most climbs have elevation gains of between 1,000 and 2,500 feet. 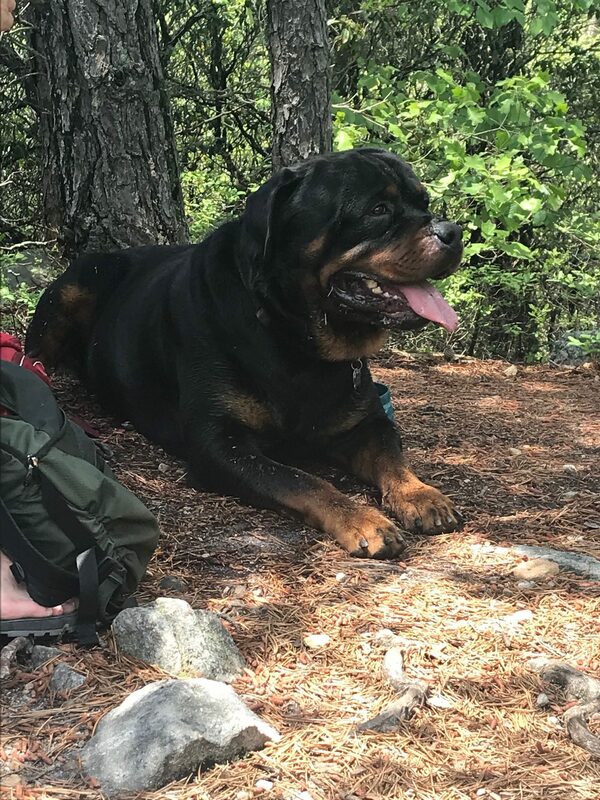 Some of his favorite peaks thus far have been Freezeland Flats in Ramsey’s Draft Wilderness and the Switzerland-esque high-mountain meadow of Cole Mountain. Undoubtedly, his least favorite was the poorly-named “Big Knob,” which was only accessible via a road torn up by four-wheel drive vehicles. Wild Virginia member Ernie Reed and I met Eric at the top of Reddish Knob, one of the highest points in Virginia, and a region steeped in history. Atop Reddish Knob, in 1999, Bill Clinton famously demanded that then-chief of the Forest Service Mike Dombeck craft a policy to protect unroaded areas in our national forests. This gave way to the 2001 Roadless Rule: a groundbreaking policy calling for protection of 58.5 million acres of roadless area within the national forests. 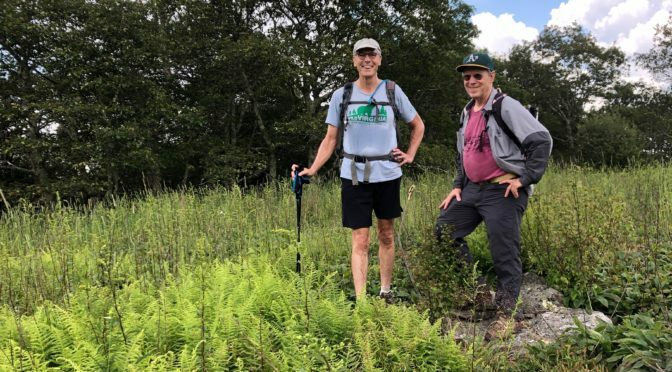 Years ago, Eric and Ernie set out to find the “wildest” place in Virginia: the region that is farthest from a road on all sides, that could be designated as wilderness. 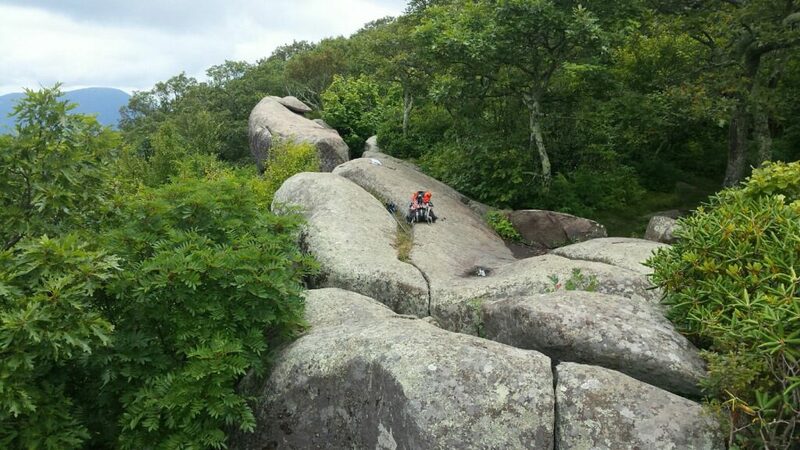 What they found was in the heart of Little River Roadless Area, a 27.3 thousand acre region of potential wilderness of which Reddish Knob is a part. For a snack at the summit, Eric brought us his famous homemade pancakes made from banana, egg, cinnamon, and rolled oats. Born in Staunton, Eric is a Central Virginia native, but he cites some of his first, most precious memories as exploring the Grand Tetons during his childhood in Idaho. After moving to Western Pennsylvania, Eric attained a B.S. in Man-Environment Relations from Penn State and went on to pursue an MBA there. After a 20-year stint as an account executive for large computer companies in the ‘80s and ‘90s, Eric longed to nurture his environmentalist roots. Upon returning to Central Virginia, Eric began volunteering for various environmental nonprofits. In 2002, he joined the board of the Shenandoah Ecosystems Defense Group, which now holds the catchier, less verbose title: Wild Virginia. On the board in 2002, he met Ernie, now one of his best friends, and the rest is history. After 12 years on the board, Eric resigned in 2014. Aside from Wild Virginia, Eric has done energy efficiency work in Charlottesville and helped found the Local Energy Alliance Program (LEAP), a nonprofit that conducts energy assessments and helps homes convert to solar energy. Eric also helped found Appalachian Sustainable Development, an organization that contracts with loggers to make available sustainable, locally-sourced lumber. In the past decade, Eric has taken his sustainability to a new level through his latest project: building a completely eco-friendly house. Eric spent five years building an 800 square-foot house made entirely from wood harvested from right off his property, in GWNF. The small, cozy house is designed with a number of features that make it energy-efficient: it has no interior doors or hallways; triple-pane windows; a heavily-insulated roof deck; a metal roof; and the house is oriented toward the south. With windows on the south side, they get solar gain during the winter — heat is stored in thermal mass during day and released into the house in the evening. In the next couple years, Eric hopes to go off the grid. The house boasts a tiny wood stove, cabinets made from local wood, and radiant floor heating heated by a domestic water heater. In essence, this means that Eric’s family gets hot water for bathing and cooking from the same power source that heats the floor. The house’s walls are 12 inches thick, which means more thermal mass, modulating the indoor temperatures more evenly, and for longer periods of time. Eric hopes to finish peak-bagging in October, after a brief interlude to vacation in Canada in August. What will Eric do next to save the planet? Only time will tell. In the meantime, I hope he cooks many more batches of healthy, homemade pancakes for those hard-working Wild Virginia interns. Through a Freedom of Information Act request, David Sligh of Wild Virginia and the Dominion Pipeline Monitoring Coalition (DPMC) has acquired almost all of the comments citizens (around 10, 000 of them) submitted to State Water Control Board through the Virginia DEQ. Individuals and conservation groups explain why the Corps of Engineers’ blanket permit is not sufficiently protective of our state waters. DEQ has promised to supply the rest by today. 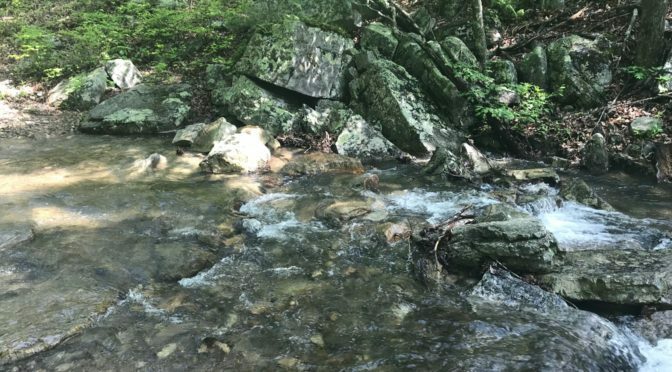 Wild Virginia has long advocated for the protection of watersheds home to brook trout populations in George Washington National Forest (GWNF), which provide enormous ecological, cultural and economic benefits. The state fish of Virginia, West Virginia and Pennsylvania, brook trout are a species of fish native to eastern North America that has thrived in the Appalachian Mountains for millions of years. They inhabit clear, coldwater streams, primarily at high elevations. Brook trout require particularly clean water and cannot thrive in stream temperatures higher than 70 degrees Fahrenheit. A healthy stream can inhabit between 30 and 40 trout families. Brook trout spawn during the fall, incubate during the winter, and hatch eggs in the early spring. The species prospers in closed-canopy forests, whose shade-cover regulates stream temperature. Since they require pristine habitats with high water quality conditions, an abundance of brook trout is indicative of a biologically robust watershed. For this reason, declining brook trout populations can serve as an early warning that the ecological health of an entire system is at risk. Currently, the livelihood of brook trout populations native to GWNF are threatened by anthropogenic climate change. Climate change is a long-term change in the statistics of weather, leading to irregularity in temperature and precipitation patterns. Both air temperature and precipitation are major drivers of stream temperature and flow, which determine population dynamics. For every degree Celsius that air temperature rises, water temperature rises eight tenths of a degree. Thus, the projected 4 degree Celsius rise in air temperature due to climate change would cause a 3.2 degree rise in stream temperatures. Climate change is especially problematic for trout, because they require cold water habitats, which — due to human activity — are becoming increasingly rare and fragmented. Because of climate change, brook trout are shifting to higher elevation streams, with stream temperatures suitable for survival. As climate change produces warmer winter temperatures, brook trout’s life cycle will be disrupted, as trout may emerge too early, when there is not sufficient food for survival. One consequence of climate change for regions of GWNF and Shenandoah National Park (SNP) is high precipitation during the winter and early spring months. Longitudinal studies in SNP have found high winter/early spring precipitation to have strong negative effects on trout abundance, as flooding from extreme precipitation can threaten vulnerable eggs as they hatch. 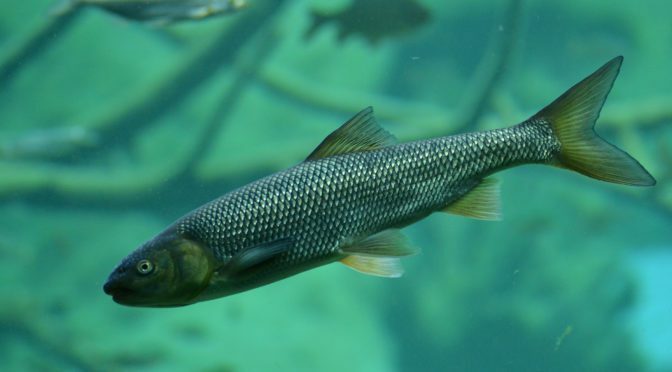 Additionally, high summer air temperatures — which will also increase with climate change — reduce trout abundance, and will force brook trout to either evolve or die off in the next two decades. Another effect of climate change is acid rain: rainfall made acidic by atmospheric pollution and the burning of fossil fuels. In the Appalachian Mountains, acid rain has impacted between 60 and 80 percent of brook trout spawning habitat. So, at this point, you may be asking: what can we do to save the trout? According to fishery biologist Ben Letcher, some solutions including putting more shade-producing trees along river banks; adding logs into streams; and limiting the number of wells removing cold spring water from the watershed. 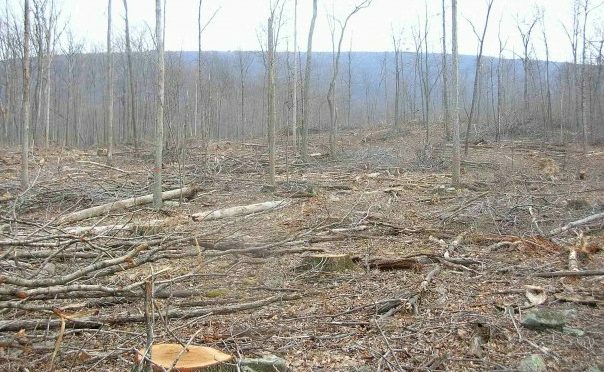 Ultimately, brook trout populations are severely hindered by logging, development, and conversion of forested lands to be used for agriculture. 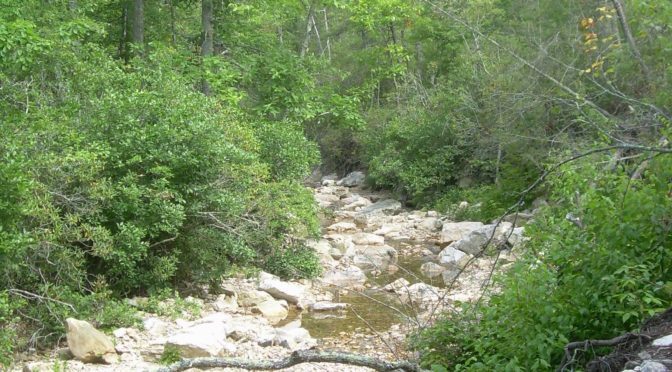 To reverse this trend, it is indispensable that we prioritize increases in canopy cover and late-successional forest habitat in order to stabilize temperatures, continually monitor water quality, reduce sediment loads in streams, and create opportunities for brook trout populations to thrive and expand their habitat. If you need a refresher or are taking a first dive into learning about the proposed Atlantic Coast and Mountain Valley Pipelines, Wild Virginia Conservation Director David Sligh is here to help. He explains what’s going on with these projects and why they pose so many threats to Virginians and the Southeast. He also offers some ideas on how anyone who opposes the pipelines can make a difference (down at question four). Do We Need the Pipelines? In short, no. 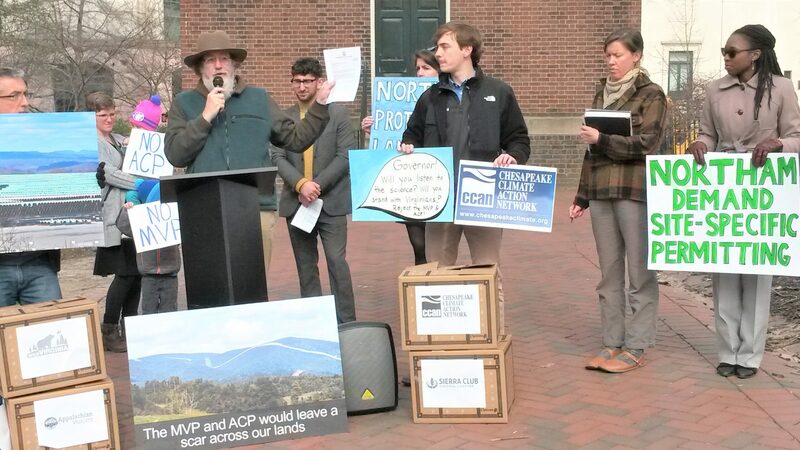 We do not need the ACP, a 600-mile-long pipeline that would carry natural gas from West Virginia into Virginia and North Carolina, or the MVP, a pipeline that would source the same fracked gas and have the same destinations. “If you look at the growth in overall energy demands in VA and NC in the last decade, there’s been a pretty small percentage of growth over the whole period,” David says. A 2016 study of this area’s energy demand for natural gas found existing pipelines can supply more than enough fuel through 2030. And, while ACP originally claimed the pipeline gas was intended and needed primarily for VA and NC, it now states the gas may go to South Carolina and other areas. Similarly, after getting their original approval, MVP says it will build an addition spur into North-central NC. That’s because they can make such huge profits from fossil fuel projects — for example, the Federal Energy Regulatory Commission allows them to charge ratepayers additional amounts to provide them with up to 14 percent profit just on the cost of building these pipelines, and this profit is not dependent on showing a need for the gas. Also, FERC has not carried out the legally required “valid needs analysis” relating to energy demand for the pipelines. Because of this, FERC Commissioners Cheryl Lafleur and Richard Glick supported a request for a FERC rehearing. Why Are the Pipelines a Bad Idea? Building a 42-inch, high-pressure gas pipeline across the Allegheny Mountains, the Great Valley of VA and the Blue Ridge Mountains has never been done, for good reason … The companies would have to build on mountain slopes that in many cases are greater than 50 percent and where landslides are common. They would have to blast away mountain ridges and claim they would restore these areas to former contours, which is impossible. They would cut across large areas where limestone geology, termed karst, lies beneath the soil and forms caverns and conduits through which pollution from land disturbance can move to wells and springs quickly, without any filtering. ACP proposes to bore a hole over 4,500 feet through the Blue Ridge and push the huge pipe through the hole. Finally, together, the two projects would cross well more than 1,000 streams and wetlands, many of which have exceptional resource values and are also very sensitive to disturbance. Also, if the pipelines are built, the industry will use them to validate an avalanching investment in natural gas for decades to come. What Are the Current States of the Projects? “FERC issued what are inappropriately termed Certificates of Public Convenience and Necessity for both MVP and ACP last October,” David says. At this point, the companies were empowered to take landowner’s property rights. In December 2017, the Virginia State Water Control Board issued water quality certifications that require the companies to submit additional plans, some related to erosion and sediment control, before construction. David says the ACP’s certification will not be officially in effect until the plans are approved. The Board also said it might take other actions at that point as well. Over the winter, both companies began permitted tree felling. In March 2018, the VA DEQ approved the MVP’s additional plans and construction has now begun. David says “court challenges to actions taken by the Board, FERC, Forest Service and Bureau of Land Management are still in progress against both pipelines.” One suit already resulted in a court order stating an ACP permit from the U.S. Fish and Wildlife Service under the Endangered Species Act was wrongly issued and must be redone. This order led to an ongoing dispute between citizens and the ACP over whether it must stop construction overall or only in some areas. Recently, the VA Board ordered the DEQ to hold a public comment period relating to waterbody crossings, which ended June 15 — over 13,000 opinions were submitted. The more than 1,000 planned water crossings “have so far been covered under a blanket permit issued by the Army Corps of Engineers [and] should receive additional scrutiny and regulation by VA,” David says. “The public is now pleading with the Board to act quickly to head off further work on either project before any additional reviews can be finished,” he adds. The push for an immediate and thorough review of the ACP’s potential effects in VA is very important because the MVP project has already broken the law, allowing large loads of mud to flow off construction sites into streams and onto private properties. “While WVA officials have already issued four Notices of Violation, the VA DEQ has been largely unresponsive and has taken no effective action,” David says. 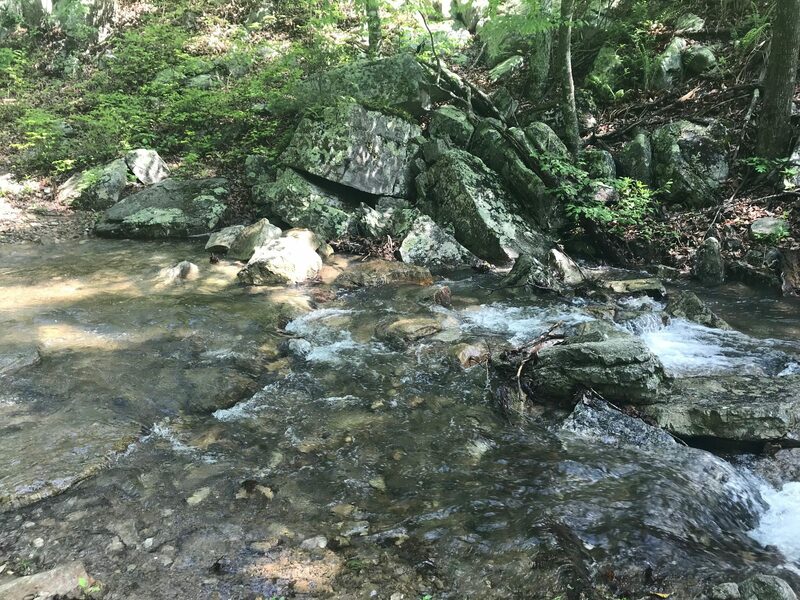 On June 21st, the federal Fourth Circuit Court of Appeals granted a stay of a Corps of Engineers permit, which prevents MVP from constructing through any streams or wetlands in West Virginia until court hearings scheduled for September. Join in calling on the Water Control Board to conduct the additional reviews of waterbody crossings. Volunteer with the Pipeline Compliance Surveillance Initiative, or CSI, which looks for and responds to damages and non-compliance by ACP, and Mountain Valley Watch, which does the same with the MVP. 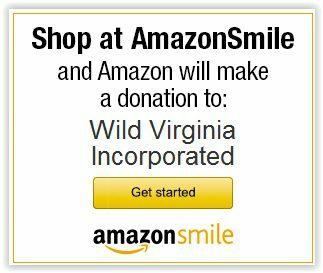 Join Wild Virginia to help us continue to lead the efforts to stop and/or avoid damage from these pipelines and to oppose any destructive projects in our region, so we can preserve as much of Virginia’s wild and natural land and resources as possible. Wild Virginia Conservation Director David Sligh has 35 years of experience in environmental law. He has a bachelor’s degree in Environmental Science from the University of Virginia and a law degree from Vermont Law School. He is a member of the District of Columbia Bar. Dave has worked as a Senior Environmental Engineer for the Virginia Department of Environmental Quality; Founder and Director of Virginia PEER, the state branch of Public Employees for Environmental Responsibility; Southeast Regional Representative for American Rivers; Upper James Riverkeeper; Adjunct Instructor of Environmental Science at the University of Tennessee at Chattanooga; and as a consultant and adviser to citizen groups around the country. 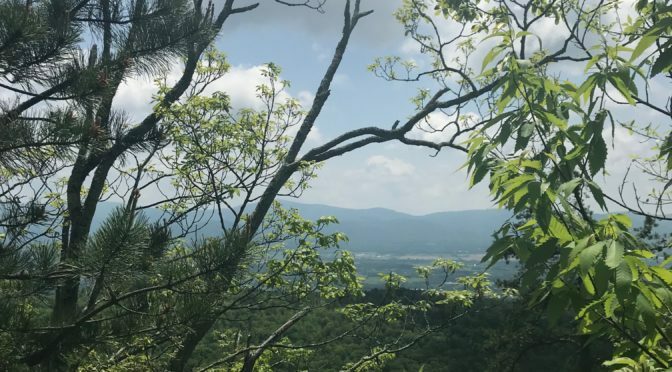 Wild Virginia has sent the Forest Service a letter objecting to an outrageous order closing portions of the Jefferson National Forest for many months. In the letter to Joby Timm, Forest Supervisor of the George Washington and Jefferson National Forest, Wild Virginia asserts the scope of the Emergency Closure order now in place far exceeds temporal limits that are necessary or proper to meet the stated purpose of avoiding “hazards associated with constructing the Mountain Valley Pipeline. . . .” and additional bases on which you have attempted to justify the scope of the closure order are not specified in the order, are invalid, and go beyond the scope of your authority. 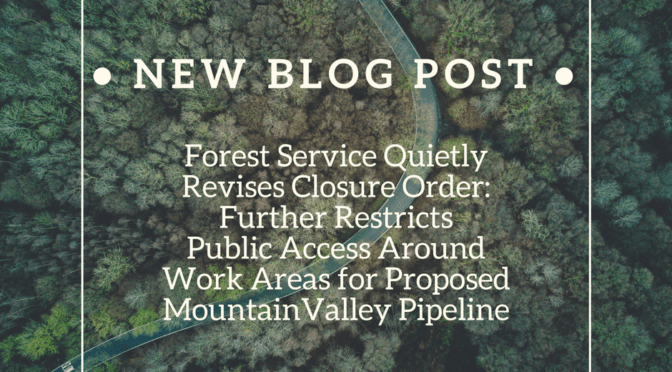 The Forest Service order prohibits the public from being present on large areas of the Forest through March 31, 2019 and presents the closure as a necessity to protect public safety when construction is occurring on the Mountain Valley Pipeline. However, the ban on use of our public lands far exceeds any appropriate boundaries and is not a rational or legally-supportable measure. The people must only be prohibited from entering and using our National Forest when and if a real threat exists. The convenience of a company to cause disruption and destruction on the Forest must not be used as an excuse for impairing the public’s valid use of areas normally available to it. Also, the Forest Service will bear no significant burden if required to issue new or revised orders to accommodate changing construction schedules. Timm has so far issued five successive versions of the order between March 7 and April 7, 2018, a period of just 31 days. Given this record, it is ludicrous to cite “the process involved in issuing multiple closure orders” as a justification for the excessive length of your order. Wild Virginia insists that Supervisor Timm revoke the current order and that any future order specify that the public’s use of roads, trails, or any other areas on the Forest is prohibited only during active construction or authorized uses by MVP. 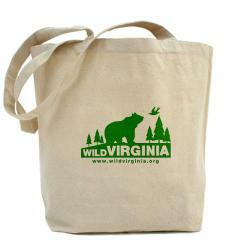 Wild Virginia offers the following to help citizens begin to frame their comments in response to DEQ’s public notice. Any comments you submit will be enhanced by photos of existing good conditions or any other background documents that show a history of usage of waterbodies and the values they have held for people. We also welcome you to send us any copies of comments you send to DEQ so that we can keep track of the places addressed and the issues raised for both pipelines. • The name(s), mailing address(es) and telephone number(s) of the person(s) commenting. • Information about specific wetland or stream crossings. Comments should reference exact wetlands and streams crossings by the identifiers provided in documents supplied by DEQ. 3) the sufficiency of the Commonwealth’s § 401 water quality certification of NWP 12, as related to specific, wetland or stream crossing(s). Quality Standards (WQS) will not be violated by the activities covered. downstream waters. In some cases, you may want to cite a group of crossings and discuss both the individual impacts and the combined impacts. projects and ignores the overall impacts. This is especially important in some headwater drainages where as many as eight or more crossings are proposed. that apply only in specified waters include support of trout populations and public water supplies. fishing, and simply aesthetic enjoyment. Also, note that many of these uses also qualify as“existing uses,” even if Virginia has failed to list them as designated uses (more discussion of this below under the antidegradation section). Note: the water quality impacts that are prohibited need not be of a type that are dangerous to health, they may simply make use of the area unpleasant or cause users to abandon these areas in favor of other more acceptable waters. • You, your kids, or your dogs like to jump in the stream. • You hike, camp, or picnic along a stream. inn, bed and breakfast, etc. parks, etc. in and around the affected waterbody. • Sediments that will be released during crossing construction activities and after will affect the appearance and viability of using the stream. The Corps permit assumes that as long as the sediment in the waters only persists for a short time in the area directly in and around the construction site and that any discharges are minimized, this pollution need not be counted as an impairment of uses. Sediments in the water also interfere with fishing, because they lessen the ability of the fish to see lures and of the fisherman to fish by sight. This directly conflicts with WQS, which require that uses be protected at all times. and will not disperse. Sediment input to such waters are one of the major sources of impairments and may also carry other pollutants into the reservoirs, such as nutrients which contribute to algae blooms. • Elimination of streamside trees, which will drastically change the appearance of the stream and its surroundings and allow more light to reach the stream when leaves are off and the temperatures are highest. This also eliminates habitat for wildlife that lives near but not in the waterbody. in those areas. Replacement of that vegetation by rip-rap, which the Corps discourages but will allow in some circumstances, eliminates the biological values provided by native plants, such as hiding places for fish and habitat that is necessary for other organisms. • Changes to the physical structure of the stream bottom. The Corps requires that the ditch through the stream be filled after construction so that the “original contours” are restored. However, if the ditch is refilled with loose materials, that soil and rock mixture may wash away in storms, resulting in a depression and even exposing the pipeline. Where construction requires ripping or blasting through solid rock stream bottoms, the materials put in to replace that bottom may be much less durable that the bedrock and may degrade. In some cases, the companies propose to fill bedrock cuts with concrete. • Some of the Corps’ requirements prohibit more than “minimal adverse impact” but the Corps admits that “[t]he term ‘minimal adverse effect’ cannot be defined because it is a subjective term, with ‘minimal’ and ‘adverse effect’ dependent on the perspective of the person conducting the evaluation or assessment.” The state has a duty to define the level of impact that is allowable under its WQS and that definition, when applied to recreational and aesthetic uses should reflect the users’ values, not that of the Corps or the pipeline company. lowering of water quality could not be allowed in any case. 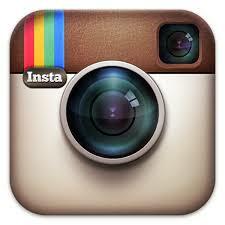 go through an extensive process and show that there are very high value resources. Wild Virginia has learned, through a March 24, 2018 email from Forest Supervisor Joby Timm of the George Washington and Jefferson National Forests, that the U.S. Forest Service issued two revised Emergency Closure Orders for areas of the Jefferson National Forest, covering two roads and the proposed path of the Mountain Valley Pipeline (MVP). New versions of the original Order from March 7, 2018 were issued on March 10 and March 19, 2018. The Forest Service did not issue news releases to alert the public to these revised Orders and has not yet posted alerts about the revisions on its web site. The March 7 Order was unclear as to the time period for closure of lands in and adjacent to the pipeline right-of-way. The current version defines an exclusion zone stretching 200 feet on either side of the center line for the pipeline in areas where tree cutting has not yet occurred. In areas where a “disturbance corridor” has already been cut through the Forest, the public may not approach within 100 feet on either side of the approved right-of-way, which itself will be 125 feet wide in most areas. Wild Virginia wrote Jobi Timm, Forest Supervisor for the George Washington and Jefferson National Forests today, calling on him to clarify provisions in an Emergency Closure Order for the Mountain Valley Pipeline (MVP). Wild Virginia seeks assurances that any restrictions on the people’s use of our public lands will be strictly limited and clearly defined. 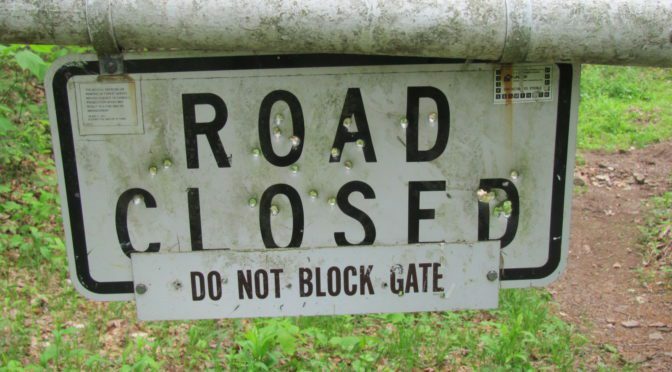 The Closure Order prohibits the presence of motor vehicles “where construction associated with pipeline activity is occurring and when closed by a sign, gate, or barricade,” apparently excluding the public only while active construction is taking place and warnings or barriers are in place. On the other hand, the Order fails to explicitly limit the period of closure on and adjacent to the pipeline right-of- way and does not call for signs or barricades around the affected areas. Further, while the Order uses the word “construction,” the Forest Service failed to define that term in relation to the Closure rules. 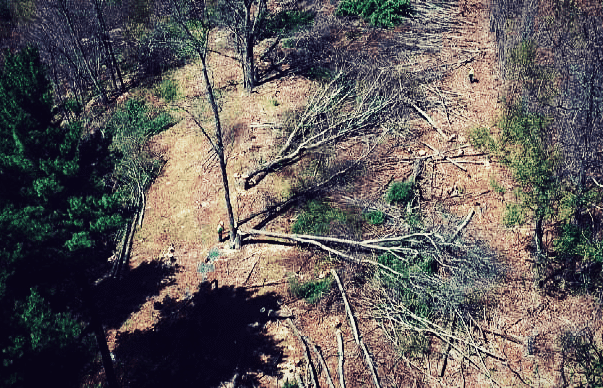 Sligh said, “other state and federal agencies have created a false distinction, claiming the tree cutting now damaging our forests is not ‘construction.’ We need to know whether that bogus use of the term is to apply to the Forest Service’s Order or not. limitations, will allow the public to play its proper role as safeguards of the public interest.” Wild Virginia calls on Supervisor Timm to answer our letter as soon as possible but, more importantly, to give the public clear and explicit answers to the questions we and many others have regarding our use of these treasured areas, which the Forest Service is charged with managing for the wider public benefit.